What could possibly be worse than a house full of sick kids? A sick mother too! The past couple of weeks in our household has been a hot pot of vomit, headaches, allergies and fevers. Not pretty at all. No exaggeration when I tell you that week after week, when one sickness goes away, another comes creeping right back in and bouncing from one family member to another. Here I thought labour pains to be one of the most painful things I’ve ever experienced (albeit one with positive and happy conclusions), have you ever got an adult ear infection before? Never do I hope and pray that I ever experience that again. Aside from the fact that I can be somewhat of a melodramatic hypochondriac when sick (yes, the world is ending! ), this ear infection that I contracted after recovering from a horrid flu virus was extremely uncomfortable and painful to say the least. Which is why it pained me to see my 8 month old baby go through his first ear infection as well after also recovering from a bad flu virus. Poor, poor baby. To make things even worse, he then got a bad allergic reaction to the antibiotics he started taking to clear the ear infection. I wish I had known that it’s best to let a little one’s ear infection clear naturally on it’s own then resort to antibiotics right away. The plus side to that awful experience is that we now know he is allergic to penicillin. My 4 year old daughter who thankfully got the better immune system from her father (knock on wood), rarely gets sicks but when she does, she gets really sick. And this nasty bug that has invaded my home made sure not to miss my little girl either. What worries me about my (very active) daughter getting sick is that she also is going through a slightly picky eating stage at the moment too. She eats well but the balance in food groups isn’t so great. On top of that, I’m also concerned that she isn’t getting enough sun as she should (especially considering the really disarrayed weather as of late). One day your enjoying the warm sunshine in flip flops and shorts, the next day sitting next to an open fire with hot tea seems more appropriate. If you’ve already read, I am a big fan of the Adult Essentials Gummies Vitamins (what my husband and I take every day), but did you know that they also have a line strictly for kids? 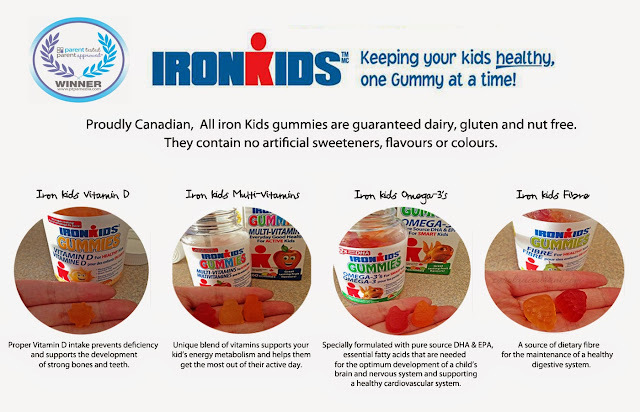 PTPA-Winning IronKids Gummies are specially formulated to support the health, growth and development of your children. Not only are they all-natural Canadian-made products you can trust, but they really taste yummy! My daughter LOVES her gummies! I have to remind her that she can only have a certain amount per day (I also have to remind myself that when taking my own Adult Essentials Multi-Vitamins) — they taste so much like candy! IronKids are sold in Real Canadian Super Stores, Loblaws, Shoppers, Rexall, Metro, Sobeys, Target, Walmart and you can find the Omega 3s in Costco. 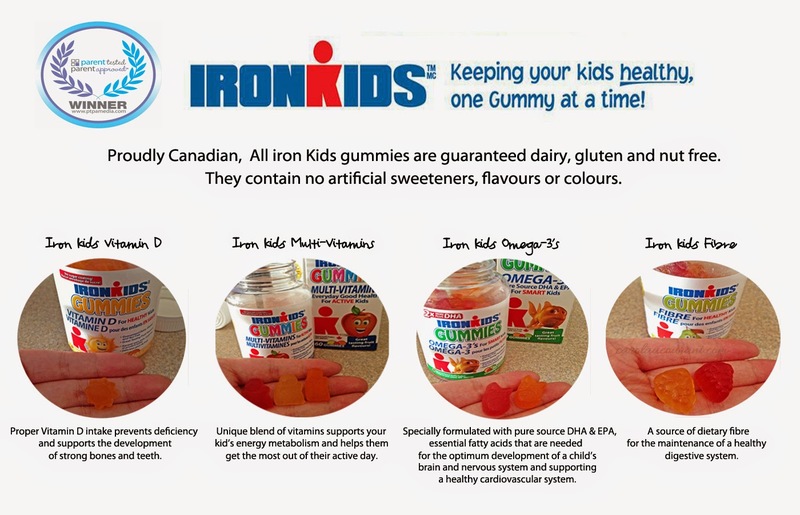 To learn more about IronKids Gummy Vitamins, visit them at http://www.iron-kids.com. She was super excited to receive a generous new supply of her favourite gummies (we were running out!) and I’m even more excited to share this with my readers! 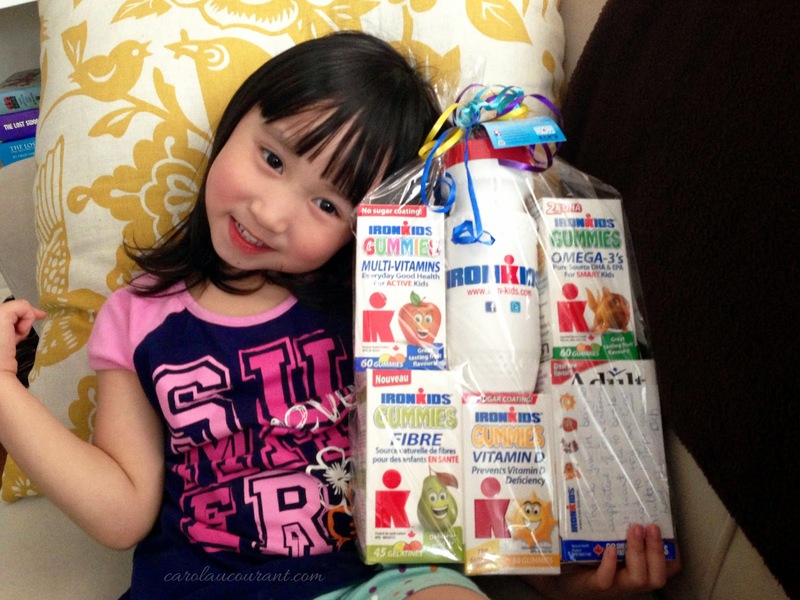 One of my readers will win this awesome IronKids Prize Pack which includes: 4 IronKids Vitamins, 1 water bottle and Coupons. To Win, leave me a comment below giving me what you do to keep your child/ren healthy and active in the Summer months. We go bike riding and swimming. We spend lots of time outside and fill our tummies with fruit, veggies and water! We are outside everyday and we love to play soccer! It’s the Summer months that we are most active in. We go to the park everyday, go on walks, go to the pool, go to the local farm, go to Centreville! My children and I eat lots of fresh veggies and fruit along with drinking water all day long in order to keep us hydrated. We also spend lots of time outdoors, playing at the local playground. shoo them outside after dinner to play! lots of fresh fruit and vegetables, getting outside to play and go for walks, and drinking lots and lots of water. Spend lots of time outside, going to the beach, playing in our yard (family of 6 so we have some mini soccer games ect) going to walk around local farmers markets and biking! We spend lots of time outside and doing fun activities like going to the petting zoo or beach! My daughter is in karate in the summer and also goes to swimming lessons. We also go for bike rides adn walks/hikes and eat lots of fruits and veggies from the gardens. We eat lots of fresh fruits and veggies, use plenty of sunscreen and go for lots of walks/bike rides! Lots of outdoor activities…swimming, walking through our parks and zoo, running through the sprinkler…time well spent! We play sports, go to the water parks,bike ride and swim!! We spend as much time out doors as possible and walk wherever we can too! my son spends a lot of time outside riding his bike,skateboard,,hanging with friends and lots of swimming,,he gets plenty of exercise for sure! I also try to make sure he is rating properly! Take them to the water park and on picnic play dates at different playgrounds. They also workout with me at home, trying burpees, jumping jacks, squats, pushups, etc. ..it is so cute!!! I appreciate their effort and delight in the fact I am being a good role model. Anything at all that interests him to stay active. Swimming, camp and just spending time on the trampoline coupled with some super yummy Iron Kids Gummies. I like to make outdoor activity lots of fun – like swimming, sprinklers and water balloons/guns, splash pads followed by a trip to the ice cream shop! 🙂 Also taking hikes and biking is what we love doing in our family too. Spend more time myself outdoors and make it more interesting than staying indoors.